27 years ago, the first book “Alte Schmiedekunst Damaszenerstahl  Volume 1” was published and sold out within a few weeks' time.Up to today 11,000 copies have been sold to a large circle of interested readers all over the world. 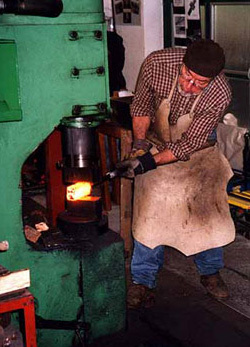 The second volume “Alte Schmiedekunst Damaszenerstahl  Volume 2” was published in 1999 and all following editions have been updated with the results of recent creative research and work, including very successful renn furnace (bloomery hearth) experiments. Researching the development of historic pattern (muster) steel goes back before 1970 when I started the tedious search for the ancient workshop oriented production process  without any useful records of the old technology.For the first time in history new results for forging practise are recorded. From forging practice, back-developments (?Rückentwicklung? redevelopments?) have been taken down and  after careful examination  used as the basis for both books. The success story of the books is based on precise practical explanations of forging process, as well as the good drawings and photographic illustrations supporting the user from the design to the finished object. Myths and legends can be experienced. Forging courses provide a sense of achievement. Overcoming the causes of error, fascinating fire-smelting exercises, the design of simple and complex patterns changed legends into understandable history of technology. Using the simple blacksmith tools like hammer and anvil and the help of the fire did not destroy the myths.Maximum performance of earlier smiths arouse respect and admiration. The books describe sections of advanced technical culture history in central Europe, a period of the heyday of the 6th to 8th century.I deliberately did not use the help of modern technology but only old welding tools like sand flux (Flussmittel?) and crushed hammer tinder.The easily comprehensible technical principles lead even less experienced smiths to successful results. I would like to thank the customers and readers for the kind reception and judgement of my books, among them numerous blacksmiths who  through the help of these books  have become successful smiths of Damascus steel themselves. Future findings will be reported on my website www.damaszener-stahl.de or www.damaszenerschmiede.de.